In this document I will show you how to enable CANlib in Visual Studio 2017 when creating a C++ project. I will show how to create WIN32 and WIN64 applications. I will also show how to handle the platform-settings: x86 and x64. 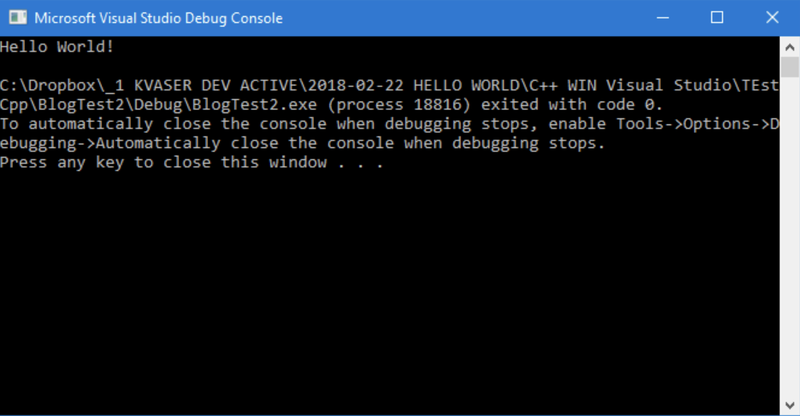 When this is done, you can use the same project (source code) for creating WIN32 and WIN64 applications without editing your code. The instructions in this document can also be used when enabling CANlib in an existing project. First we must download and install “Kvaser CANlib SDK“ and also “Kvaser Drivers for Windows”. When CANlib is installed, please check your hard-drive and identify where Kvaser CANlib has been installed. Please remember where you found them as you will need this information soon. Now we are ready to start Visual Studio 2017 (C++). Creating a project in VS2017 can be done in many different ways; this is one way to do it. Edit the name and the rest of unique information and press “OK”. Now VS2017 creates an application for us. It is a bit boring, only an empty console that does almost nothing. I will now add some code that uses CANlib. Exactly what it does is not important in this example. For more information about how to use CANlib, please check CANlib SDK Help. Add some code inside the “main()”. When trying to run the application, I get multiple errors. Something is wrong and VS2017 cannot find CANlib. This is correct behavior for this application as we need to add information so VS2017 can find CANlib. See section 5: ‘Add CANlib to project’. Add the text “canlib32.lib”. You only need to type it, no browsing. Add the include directive: “#include “canlib.h” to your source code. I can now select x86 (win32) and x64 (win64) as active platforms. In both cases, the application starts correctly and CANlib is available and working. 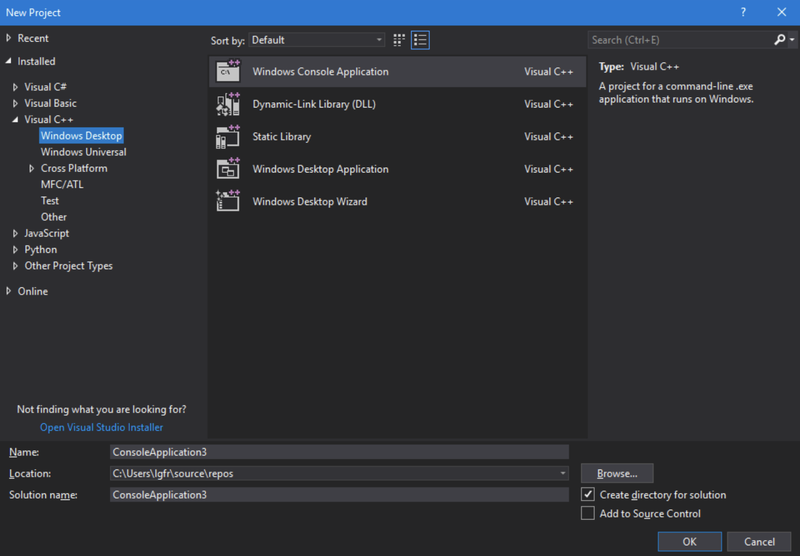 If everything worked well, you should also be able to create a C++ CANlib application in Visual Studio 2017. We have now enabled CANlib in Visual Studio 2017, created a C++ project and tested it for both x86 and x64. Please remember, when using your application on a “client machine”, install “Kvaser Drivers” and “Microsoft Visual C++ Redistributable for Visual Studio 2017”. Can you use Kvaser Leaf light 2.0 with this SDK? Yes! You can use this SDK for all our interfaces and loggers. It is the same SDK for all our interfaces, and if you have developed an application for our LEAF interface, then you can use the same application for all other interfaces without changes. (Except for model specific functions). We also have included VIRTUAL interfaces in our drivers.You can use them as interfaces for testing the SDK before you buy an interface. Good Article..This was really very useful information Thank you so much for sharing this..